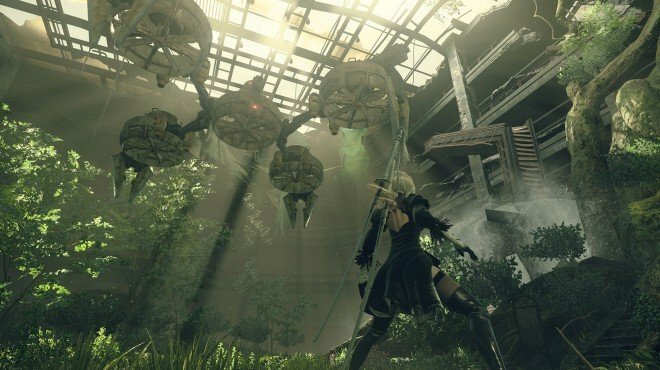 Robo Dojo--Brown Belt is a Side Quest in NieR: Automata. "Father Servo has enhanced himself using the parts you gave him. Go verify the results for yourself." "You emerged victorious from Father Servo's training, but he demanded parts as payment for his services. Go find the requested materials." Acquire 1x Memory Alloy and 1x Broken Circuit. In order to get this quest you will need to find the red dot on the top of a tall building near the Desert Zone entrance. You will need to climb on to a nearby building and get on top of the water tower and double jump and then dash mid air to get to the building. Defeat a dual-axe wielding, level 30 Father Servo and speak with him to obtain the quest. Once obtained spar with him and defeat him again. After defeating him the second time he will ask you for a Memory Alloy and one Broken Circuit to complete this quest.